Now that we are purchasing our home, we have no excuse to live in it like we are renters. The basic beige walls that the home came with remind me of an apartment, and we jumped on the opportunity to repaint one of the rooms with something that had personality. Here are two of the walls in my boys' bedroom. Boring. Like every other room in the house. We picked out 2 colors from the Cars family of colors: WDCR06 - Taillight (which is a red) and WDCR05 - Making Tracks (which is a grey) and got to work! 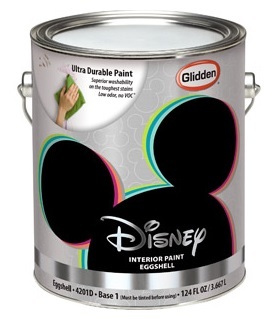 The Disney Paints from Glidden come in a range of colors, and they all have some very appealing perks that you'll want to know about. First, they are low-VOC. This basically means that you won't feel like you are walking into a toxic waste site when entering a freshly painted room. I'm pregnant, so I'm leaving the painting to my husband, but I didn't have to evacuate the home while it was going on. A few windows open kept air moving, and I really couldn't smell much when the project was happening. They are also very nice to apply. My husband, who has painted more rooms than I can count, commented a few times on how thick the paints were and how nicely they coated. As you can see below, even the red paint, which is a difficult color to work with -- in general -- covered fairly well on just the first coat over a light surface. He did go ahead and do 3 total coats, because we didn't want any spots showing through, and it just went on so well. These paints have a great finish when dried. They can repel dirt and smudge like a "kid" paint should, but they have a grown-up feel that keeps them from coming off shiny like the paint on a preschool's walls. So, what do the walls look like now? After painting the walls, the wood trim around the windows and along the floors, as well as the metal baseboard heaters, it is a HUGE improvement over the bland look we had before. I was a bit worried that the red would overpower the small bedroom, but since we just did one accent wall in red, and the gray was really a lighter shade, it balanced out really well. The boys are VERY excited to see their room with some personality, and I'm a bit relieved that I may not see so many smudges and shoe marks on the wall the bunk beds rest against (the red wall.) We still have some work to do with replacing an overhead light and refinishing the bunk beds, but the paint gave our project new life and really motivated us to make our house OUR home. Where can you find this paint? At Walmart! See your store for the full color palette and be sure to check out their specialty finishes. They also have chalkboard paint (Great Slate), Magnificent Metallic, Speck-tacular (Speckled), and All That Glitters. We will be doing another project soon with the glow-in-the-dark paint (Ready Set Glow), so be sure to check back!